The works of Carlos “Botong” Francisco have greatly contributed to the development of our country’s culture and heritage. Aside from being well-known for his boldly colored paintings that boast folk values, Francisco is also recognized as the artist who paved the way for mural art’s rise to prominence. He along with colleagues Galo Ocampo and Victorio Edades introduced a notable characteristic of the modernist art movement, a form that veers from the style of paintings prevalent during his early age—which is mostly dipped in Fernando Amorsolo’s inclination to romanticism. Francisco is also the man behind the discovery of the Philippines’ oldest form of art, the Angono-Binangonan Petroglyphs. He saw the ancient artworks on a vegetation-covered rock shelter in Binangonan, Rizal during a camping trip with the Boy Scouts of the Philippines. As we commemorate Francisco’s 50th death anniversary tomorrow, Mar. 31, let’s get to know the second National Artist for Visual Arts in history by taking a virtual tour around his ancestral home in Angono, Rizal which also houses his small but highly significant bi-level studio. The star of the room is Francisco’s wooden easel and chair. It’s holding a framed portrait of his wife which he did not make. “It’s a gift from a close family friend,” says grandson Totong Francisco. The entrance to Francisco’s home would make you feel like you’re entering an interactive museum. Relief artworks are scattered everywhere: from doors and hinges to frames. Displayed on every corner are an assortment of Francisco’s paintings, sketches, and trinkets. 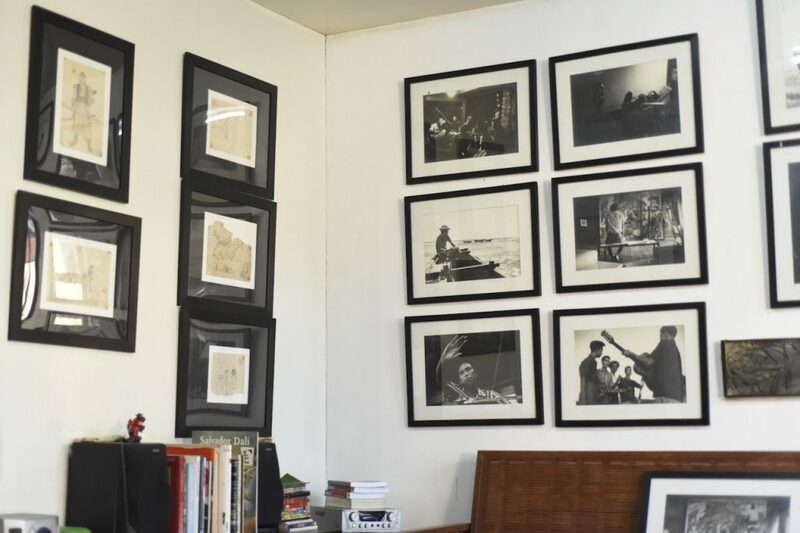 Standing out at the center of the wood-dominated Francisco living room is a wall filled with framed monochromatic photographs. “The photos are some shots lolo kept while working as a production designer for Genghis Khan,” grandson Carlos “Totong” Francisco told Nolisoli.ph. Genghis Khan is a film directed by Manuel Conde released in the 1950s. It tackles the story of the Mongol ruler and emperor who maximized his skills against all odds to provide for his tribe. 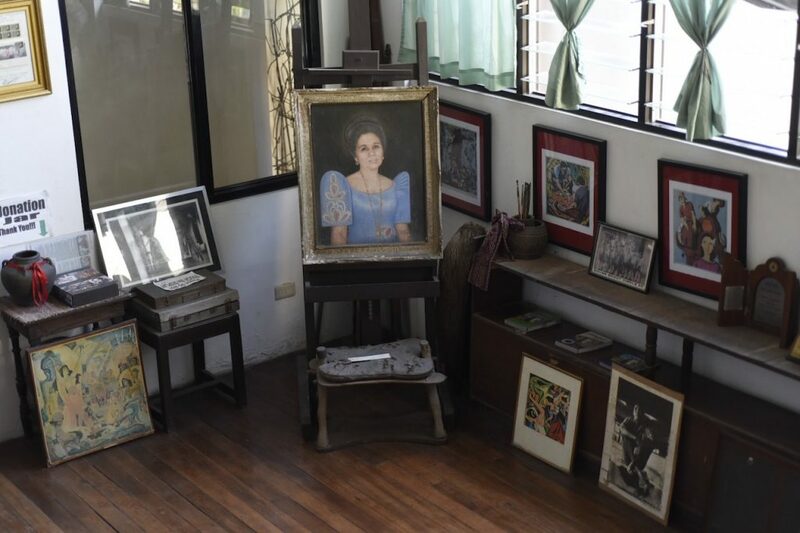 Just beneath this area is Francisco’s original decades-old studio which used to be, as Totong recalls, “very small and cramped.” But despite its size, this studio has stood witness to the birth of Francisco’s various masterpieces. 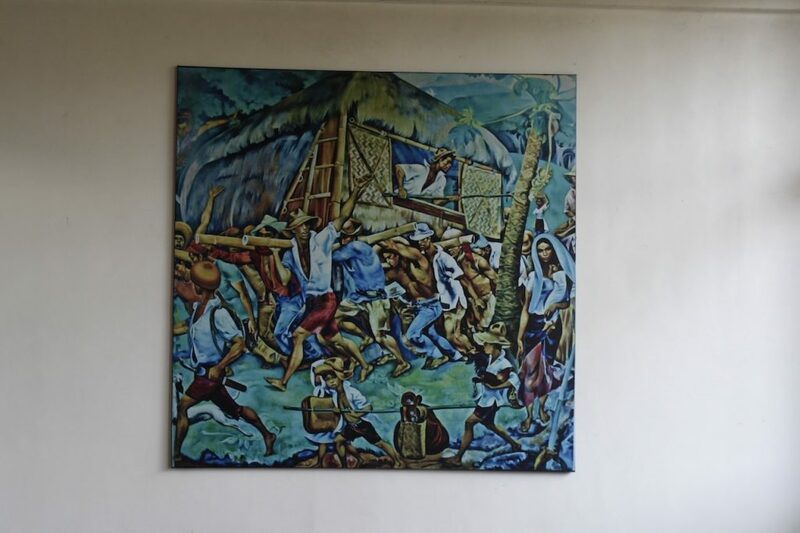 It was here where he conceptualized the famed Bayanihan, an oil-on-canvas painting that depicts a group of Filipinos carrying on their backs a nipa hut—a tradition commonly seen in old villages. 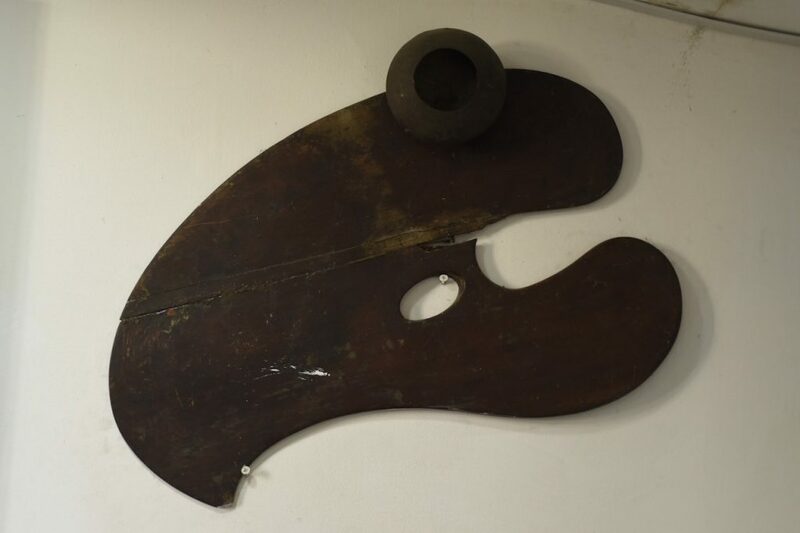 One of the original versions of the Bayanihan (1962) is displayed in Francisco’s studio. The studio also contains Francisco’s souvenirs from the costume and production design work he did for old movies. “Most, if not all, of lolo‘s movies are based in Rizal, kaya po maraming props na madali niyang nakukuha and iniiwanan. Dito niya nilalagay. ‘Yong iba namang kagamitan for shooting ay niregalo na lang din sa kanya. Souvenir, kumbaga,” Totong said. Occupying one side of the studio is a line of glass cabinets that hold the artist’s memorabilia. 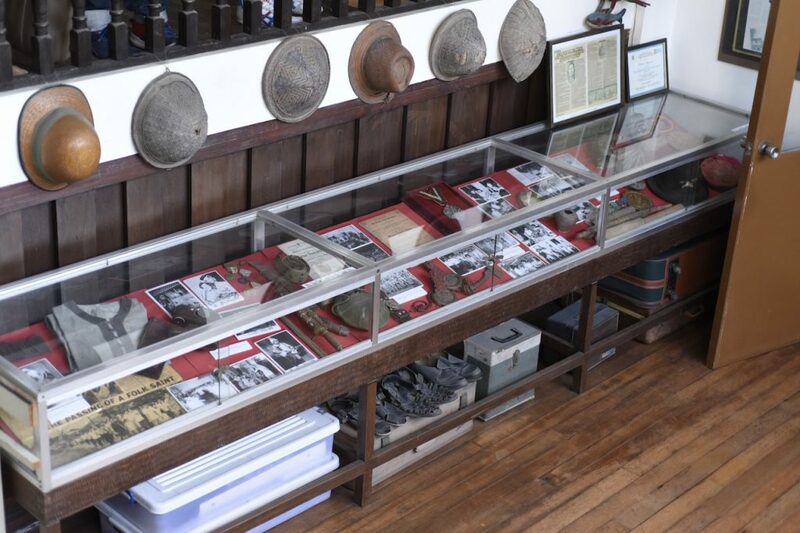 Other memorabilia kept inside the glass cabinet are photographs of the artist at work and at courtesy calls, his studio’s look in the 1970s, and some medallions. Beneath it are more souvenirs from his designing stint. Across the cabinet are three of Francisco’s mostly used easels, brushes, dried up paints, and even his favorite chair—all preserved and well taken care of. This medium-sized palette hanging on one side of the studio is Francisco’s favorite. “He has a lot of palettes kept somewhere [here] but this is the one he commonly used. We don’t know if it’s because of its size or weight, but he preferred to use this thin board as his partner in painting,” Totong said. Some of these brushes are Francisco’s while some are Totong’s who is also a full-time artist. Most of Totong’s works are inclined to abstractions with a hint of cubism. Standing quietly at one side is a narrow staircase which leads to the library and drafting table of the National Artist. Scattered on every surface are a number of books on art, particularly those that shed light on impressionism (another art movement Francisco often instilled in his pieces) and certificates of recognition issued to Francisco by various government agencies. 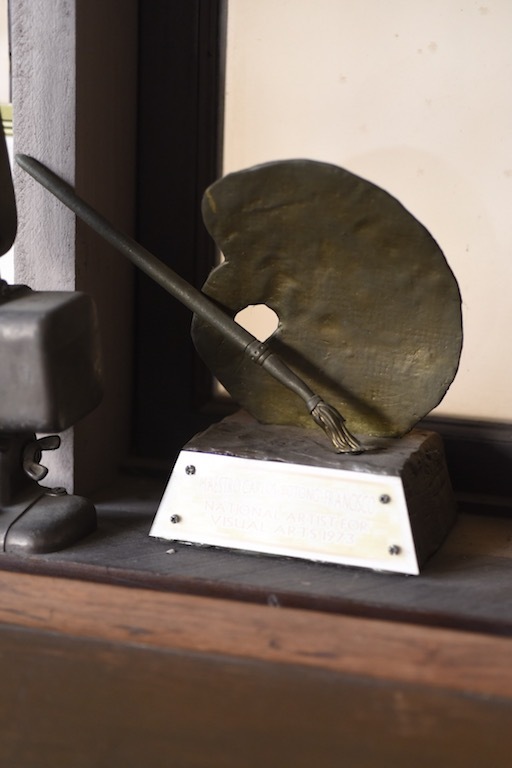 When you’re up-close and personally surveying this area, there’s one thing that will instantly capture your attention; and it’s Francisco’s 1973 National Artists Award. Beside it is a portrait of the Filipino artist himself—another gift from a close family friend. 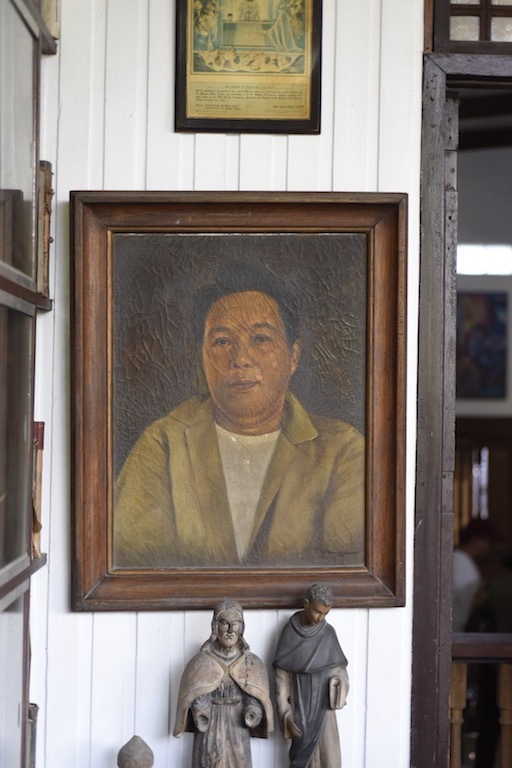 Totong emphasized during the tour that his family makes it a point to never impose a time limit to people who want to have a glimpse of his lolo’s atelier. You can pay a visit to Francisco’s studio and ancestral home at Doña Aurora St., Brgy. Poblacion Itaas in Angono, Rizal. It’s a place you will spot instantly, given that huge busts of Francisco and his friend, fellow Angono native, and National Artist for Music Lucio San Pedro are displayed at the corner of the street. There are also golden-hued wall carvings showcased in almost every wall of the area.